I recently got a leo and bought some crickets for him and a little cricket keeper. I bought the recommended food and gave them some water in a sponge. The crickets are eating the sponge! It's not a real sponge, but plastic. 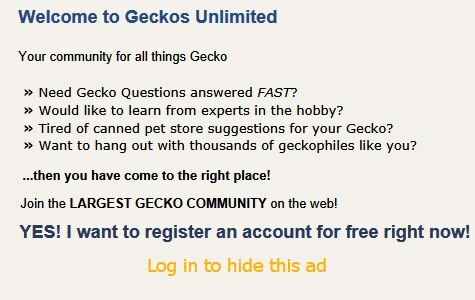 That can't be good for the gecko. Please tell me how you care for your crickets until they are fed! What do you feed them and how do you provide water? Last edited by Woke Becky; 04-03-2019 at 08:24 AM. I recently got a leo and bought some crickets for him and a lie!ttle cricket keeper. I bought the recommended food and gave them some water in a sponge. Which food did you buy for the crickets? Some dry gutloads are far better than others. Some common dry diets don't do what they claim. I lay 2 layers of paper towels right on top of the egg flats my crickets hide in. I moisten those towels about 1x each day. : Please check out the link Geopard Lecko shared in post 2. My detailed info is right there as well as details for keeping many other feeders. Thank you both so much!! Off to read and then I'll come back with any follow-up questions. I just use bug grub and put water in a bowl with my wifes cotton makeup remover pads so they dont drown in it. I could probably do things better though as they dont live a great deal of time. After reading the links, it appears that I'm doing more wrong than right. I will pick up some bearded dragon food the next time I go to the pet store and I'll transfer them all to an empty 10 gallon tank I have. I get some egg crate and that should correct more of the mistakes I'm making. This would allow me to buy more than 20 crickets at a time and make fewer trips to the store. Thanks for the info alll! You're welcome! I'm glad Geopard Lecko shared that link and that you read it. I use that exact beardie food all the time. My crickets clean their plates. Be sure to buy the ADULT blend. The expiration date is printed in black right on the beardie food's lid. It comes in 10 ounce and 20 ounce sizes. It's so much better than the misadvertised Fluker's High Calcium Cricket Diet. I get free egg crates from a local restaurant that serves a lot of breakfasts. Last edited by Elizabeth Freer; 04-05-2019 at 06:02 AM. Well I wound up with 25lbs of Elite Starter Grower non-medicated; non-soy; non-GMO organic chick crumbles--for an entirely different animal project, but it seems like this will also work for the crickets. It might work for your crickets. Please share a link for this product. Otherwise share all the ingredients.